- Publisher Face to Face books guide you into richer, more effective devotional times. Dr. Kenneth Boa's personalized adaptations of Scripture turn Bible passages into prayers that bring you face to face and heart to heart with God. 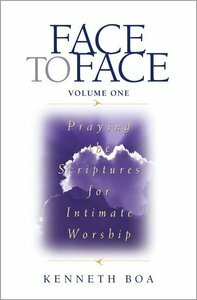 In Face to Face: Praying the Scriptures for Intimate Worship, select Scripture verses become personal prayers of intimacy and adoration that allow you to express your heart more fully to God. About "Praying Scriptures For Intimate Worship (Volume 1) (Face To Face Series)"
Kenneth D. Boa (Ph.D., New York University; D.Phil., University of Oxford in England) is engaged in a ministry of relational evangelism and discipleship, teaching, writing, and speaking. Dr. Boa is the President of Reflections Ministries, an organization that seeks to encourage, teach, and equip people to know Christ, follow Him, become progressively conformed to His image, and reproduce His life in others. He is also President of Trinity House Publishers, a publishing company that is dedicated to the creation of tools that will help people manifest eternal values in a temporal arena by drawing them to intimacy with God and a better understanding of the culture in which they live. Recent publications by Dr. Boa include Conformed to His Image; 20 Compelling Evidences that God Exists; Face to Face; Augustine to Freud; Faith Has its Reasons; and God, I Dont Understand. He is a contributing editor to The Open Bible and the consulting editor of the Zondervan NASB Study Bible.